The concept of tin wind-up toys hit the world market in the mid-to-late Nineteenth Century, and were typically found in more affluent homes throughout western Europe and the United States. However, the vintage tin wind-ups that are so often a part of nostalgia, and are seen on shows such as Pawn Stars, found much of their popularity in the U.S. during the pre-Great Depression era, and again following World War II. Today, as mainstream and popular toys look to cash-in on the nostalgia factor, we again find a variety of throwback items adorning the shelves of local and internet stores. Among them, is a series of Star Wars tin wind-up toys released last fall. 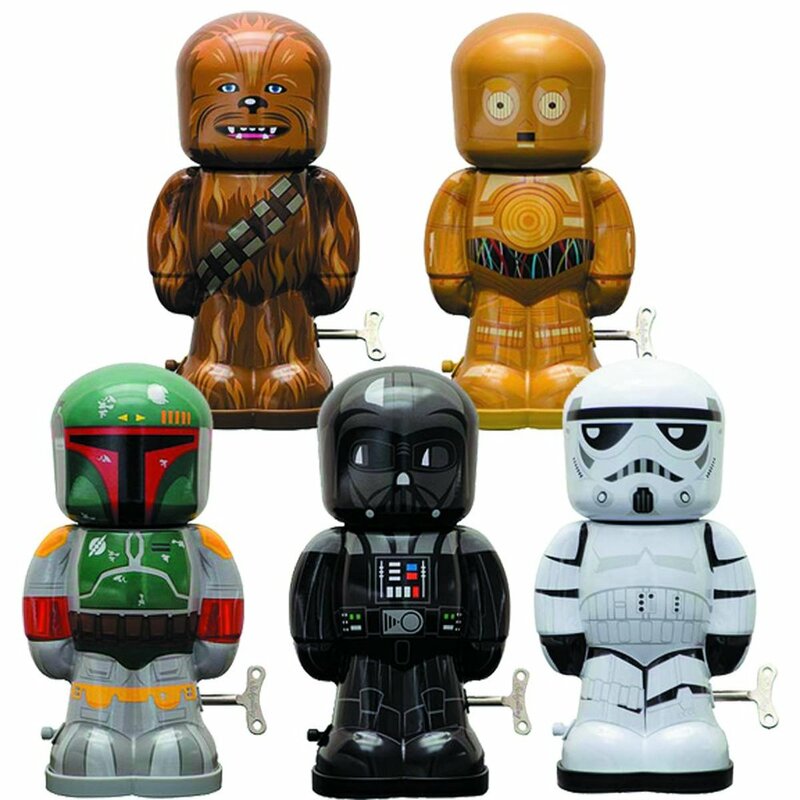 The new Star Wars tin wind-ups are manufacturing by Schilling Toys, a company who has a long-standing history of manufacturing quality wind-ups. The collection is available at a variety of outlets (I found my set at a Barnes & Noble store in the Bay Area), and each piece retails just south of the Twenty Dollar mark, making it affordable enough to rationalize the purchase. At this point, the series consists of Darth Vader, an original trilogy Stormtrooper, Boba Fett, C-3PO, and Chewbacca. There is also rumor of a Captain Phasma edition, but no actual sighting of such an item has taken place by this author. The packaging (something that matters more to some than others) is well done, though I personally would have found a more retro-style packaging that matched the vibe of the item itself to be more appealing. The distance each wind-up travels is in the neighborhood of a foot to a couple of feet, depending on the surface and how tightly you want to crank the wind-up arm. All character variants have a similar distance of travel. If asked for ideas on improving the product, I would recommend two primary changes: (1) Either expand, or change the character lineup (sorry, I'm just not a C-3PO fan) to include a greater array of original and new characters; and (2) consider changing the packaging and item itself to reflect a more "used" vintage look, similar to the used-look of the Original Trilogy films. The items are pleasing to the eye and do carry a certain retro/vintage vibe with them, despite their glossy exterior coating. The toys themselves do the job they're designed to do - you wind 'em up, and let 'em go. Despite some tweaks that I believe would make the product stronger and/or more appealing, the product makes a great addition to any Star Wars collection. Cost: Reasonable, but bordering on unappealing ($14.99 would make it a fantastic price point) Packaging: Well-done, but lacks the vintage look the toy hopes to convey Look: Detailed and reminiscent of vintage wind-ups, but a little too glossy for this reviewer's taste Feel: The overall weight and mechanics of the toy favor mass manufacturing over heavy-duty quality Durability: If you're going to play with it, expect the tin to get dented and the paint to get scratched Buy it? Borderline. I dig them, and am glad to have them in my collection, but if you're into a specific series (i.e. Black Series) and you've got a budget, it may be something you'll want to pass on.